Even if you can, chances are those motions aren’t that clear if you’re driving a car in traffic. With that in mind and the fact that about 40 percent of vehicle-bicycle accidents occur at intersections, a group of University of Illinois engineering students are developing an innovative way for motorists to clearly detect which direction a cyclist is turning. The group, under the auspices of a startup called Actif, whose mission is promote an active lifestyle, is developing a wearable system for those who share the road with vehicles, whether they be cyclists, runners or walkers that is both functional and fashionable. 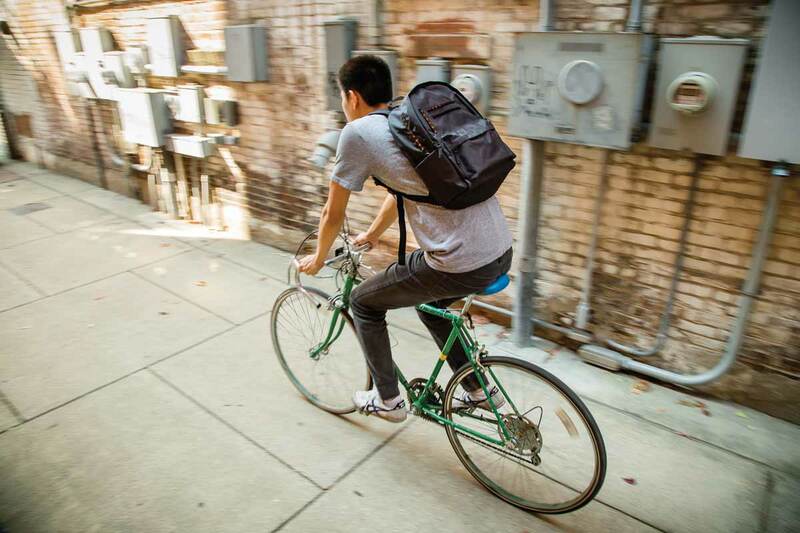 One of the company’s founders, Alex Lee, notes that while much of bicycle safety, like a helmet for example, is focused on post-accident survival, this technology could help prevent the accident altogether. “In a collision between flesh and metal, metal will always win,” he said. One of the main features is a set of LED lights that act as turn signals. The system also includes a self-actuated brake light and a haptic motor feedback system that recreates the sense of touch. The feature set will vary depending on the type of activity the user is looking for. The turn signals are wirelessly controlled by a toggle switch that is mounted onto the handlebars. Lee believes the advantage of having the lights on the back of a rider as opposed to below the seat is that they are closer to eye level for a motorist. The four students – Lee, Anish Bhattacharya, Edgar Cortez and Naoki Tsuda – are now sophomores at Illinois, but the project actually started before their freshmen years as part of the IEFX Summer Scholars Program. 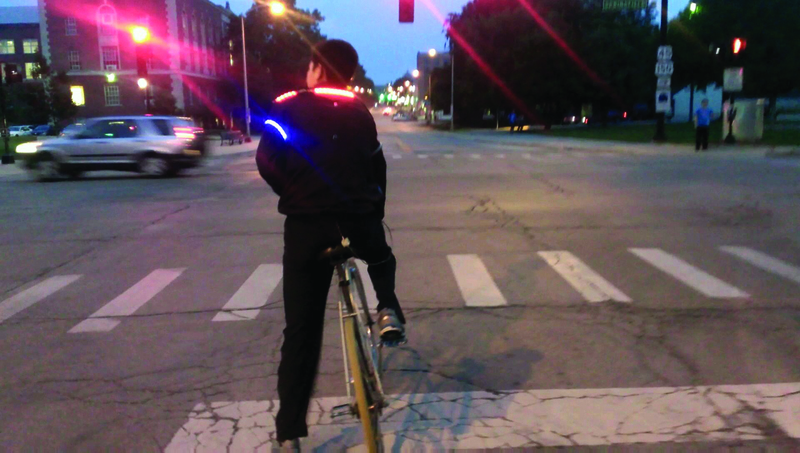 Field test of the proof-of-concept (turn signals integrated in a cycling jacket). After validating the initial concept, Lee and others built a proof-of-concept and did some field tests by riding around campus and getting feedback. Over the course of the last school year, the group moved the idea from the proof-of-concept phase into product development. Actif used the Cozad New Venture Competition, sponsored by the University of Illinois Technology Entrepreneur Center, to help move the process along. As part of Cozad, Actif advanced to the final round and earned the Samsung Research Innovation Challenge, which included a $5,000 award. Actif has also partnered with the Bike Project, which offers a space and the tools for members to build and repair bikes from recycled parts and generally advocate for cycling in the area. The group had preliminary trials with Bike Project members last year, which provided a lot of early feedback. While the initial idea centered on turn signals, the group is also working on another set of LEDs to serve as brake lights. Through haptic motor feedback, they are also working on a system to relay turn-by-turn-directions from a phone directly to the user via vibrations on the vest or backpack. For instance, when the rider is to turn right, he will feel a vibration on his right side indicating the place to turn. This concept eliminates the need to look at the GPS or listen for directions in a noisy environment, thus keeping the rider’s attention focused on the road. Whether the final product is either a backpack or a jacket, the team has researched the market and believes that in addition to functionality, the product must be attractive. As a result, Actif is working with a fashion consultant in the design. The feedback indicates the product needs to have a good design and premium build materials, and the technology needs to be invisible to the user (meaning the user shouldn’t even be aware that there are lots of components embedded into the product). From left, Anish Bhattacharya, Naoki Tsuda, Alex Lee and Edgar Cortez. 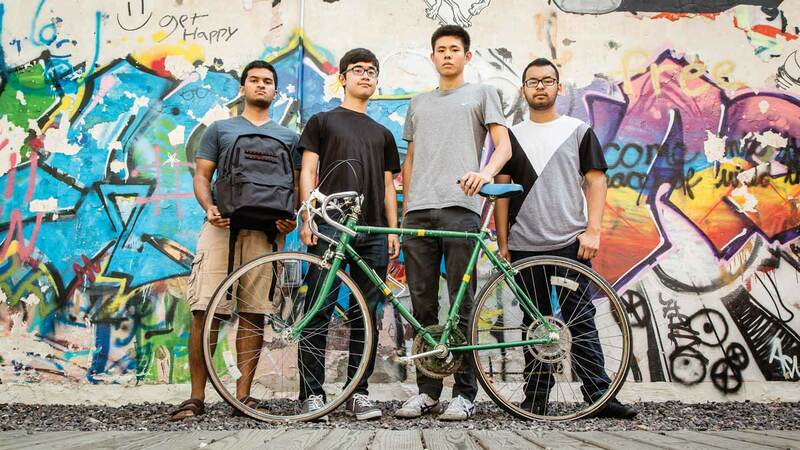 As for a timeline, they are hoping to refine the prototype for a harness/jacket/backpack by the end of the semester, then get feedback from members of the Bike Project next spring. Those additional features will be added in the future with the consumer getting the option of the features that are most important to them based on their intended use.